I unepectedly came upon the template for this fellow a while back, and decided I would make another one. I did the original back in 2009, and my sister has it. Actually the original was one we just had lying around that finally got destroyed, so I made a template of it and made a new one, and now a second new one, as seen above. 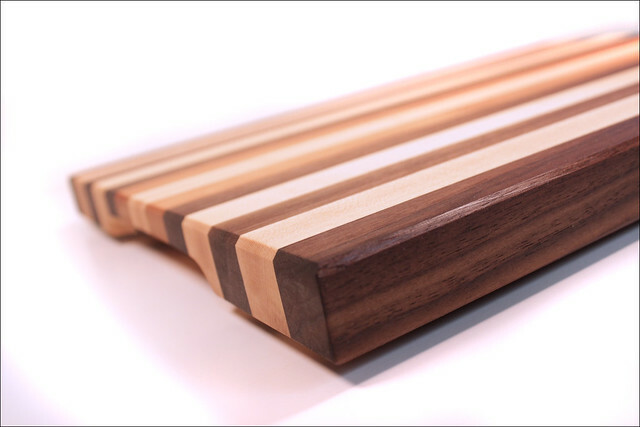 A simpler, arguably “greener” version of my Big Stripey Board, now with domestic hardwoods only: walnut, maple, and cherry. Size is a little under 12″ x 16″, and about an inch thick, not counting the little rubber feet. 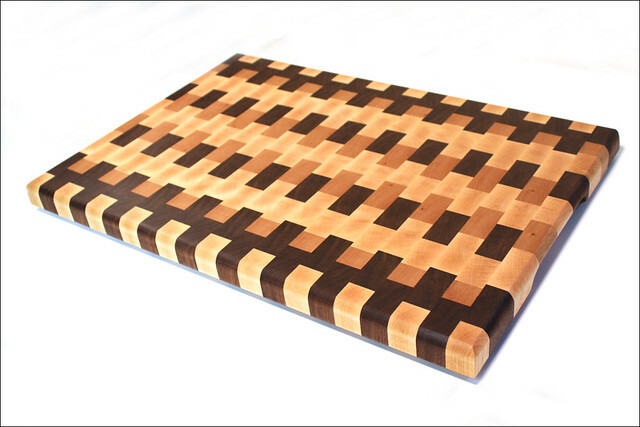 I’d been toying with the idea of trying an end grain cutting board for quite some time. 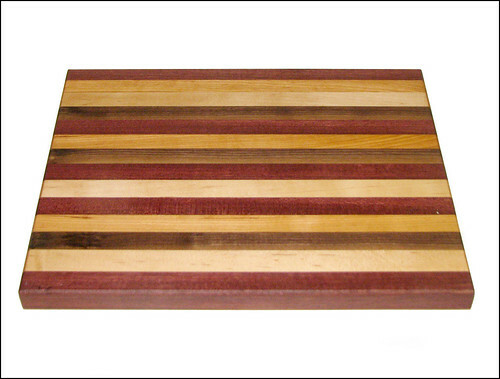 Years, in fact – since before I started making any cutting boards at all. 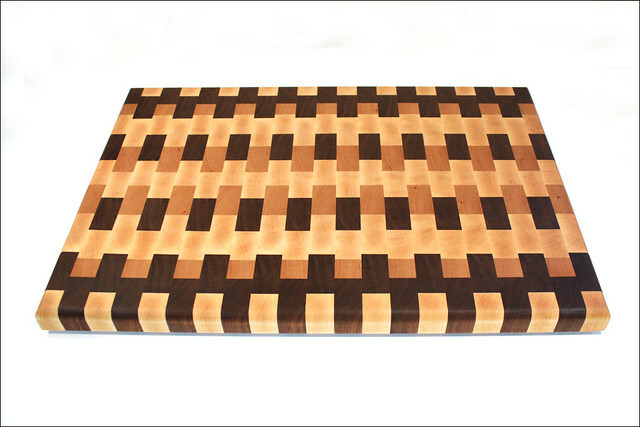 My first inquiries online brought me quickly to this article on The Wood Whisperer website, “How to Make a Butcher Block End Grain Cutting Board” containing what has come to be called, since its first appearance in 2006, “the video that launched a thousand cutting boards”. What held me back for so long was my concern about how to thickness the cutting board. The preferred method seemed to be to use a drum sander (thickness sander), which I do not have, and do not have room for. 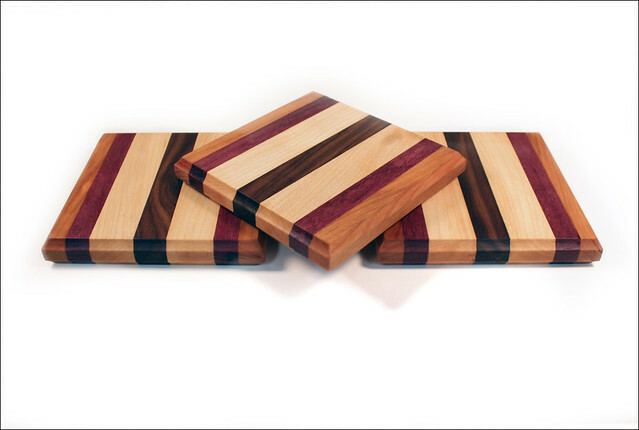 The less problematic edge grain cutting boards I went on to build (like these or like these) were fine to run through the planer, but end grain boards and thickness planers are not a good mix (see this cautionary article and pretty convincing anecdotal evidence). So of the alternative approaches I could take, including hand planes and router jigs, I opted for a belt sander. (Reasonable cash outlay, and something I should probably have around for general use anyway). Next up was figuring out a design. 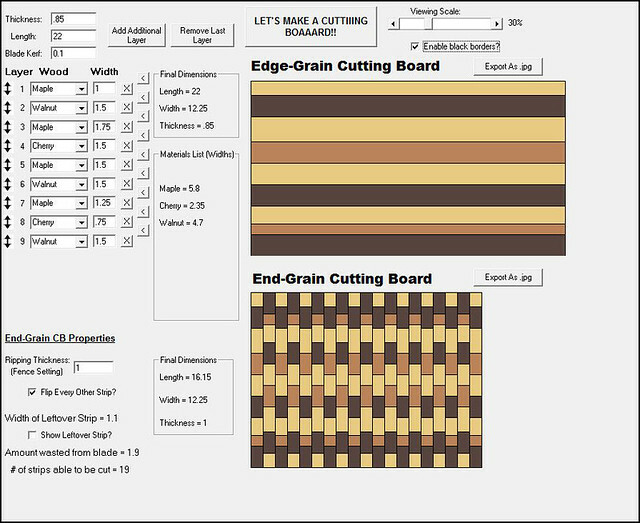 Turns out there are a couple of ways to go about constructing an end grain board, but for the approach taken in Marc’s video, there’s a very cool cutting board designer called, er, Cutting Board Designer (or CBdesigner) that I found excellent for planning my build. You can export or print your design in PDF format, giving something like the above screenshot to take into the shop. And you can export the final design itself as a JPG, to admire its wonderfulness before proceeding, as seen below. The match between expectations and final product, design-wise, was pretty impressive. It looked almost exactly as it was meant to in that regard. Unfortunately, my belt sander technique still needs some work, and some over-zealous and in places uneven sanding resulted in a board that photographs well from one side, but which is not quite up to my not unreasonable standards for release into the wild. We’ll give it a good home though. 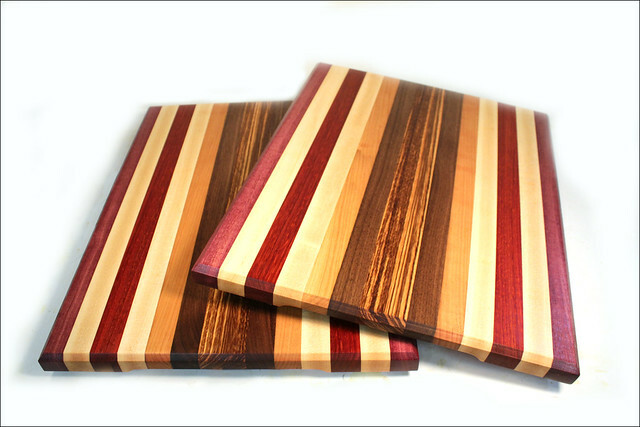 Too late for the Christmas Market Day, but they’ll keep… These new Big Stripey Boards are about 12″ x 16″, and about an inch thick. 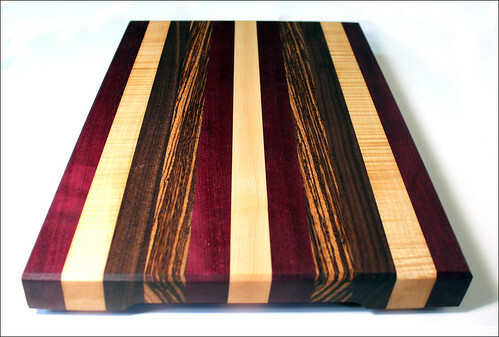 Big Stripey Board – Now with Zebrawood! 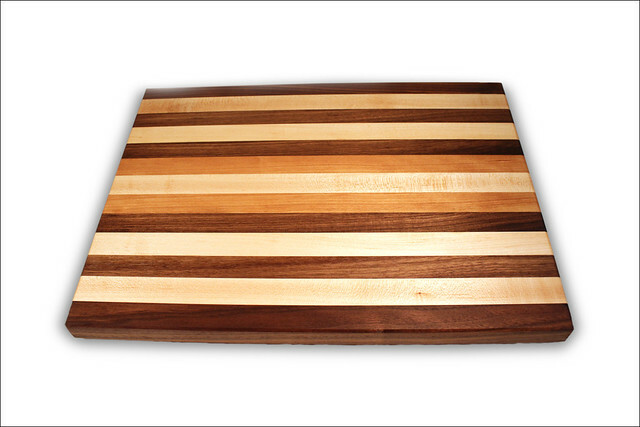 Big Stripey Board – Now with Zebrawood!, originally uploaded by rgdaniel. 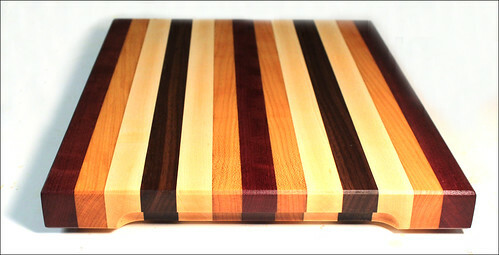 My latest Big Stripey Board, now featuring Zebrawood. I love what the zebrawood adds, I’ll be doing that again for sure. 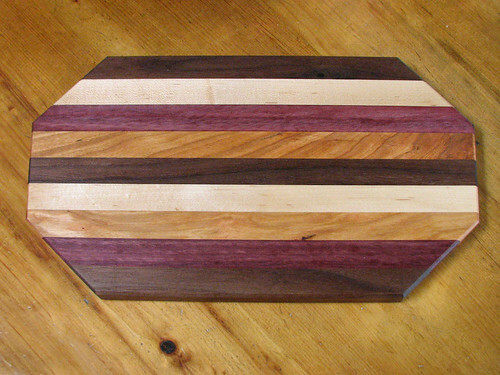 Species from the outside edges are Purpleheart, Quilted Maple, Walnut, Zebrawood, then Purpleheart again, then Maple in the middle. 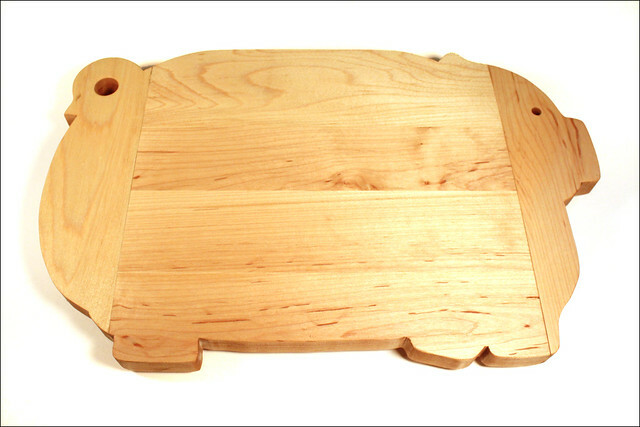 The board measures 10″ x 15″ by 1.25″. Usual features include finger grip recesses for easy lifting, and little rubber feet to keep the wood up off the wet counter. Finished with plain old mineral oil for ultimate food safety. Big Stripey Board, originally uploaded by rgdaniel. 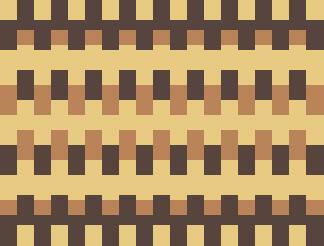 I made another Big Stripey Board, by request. 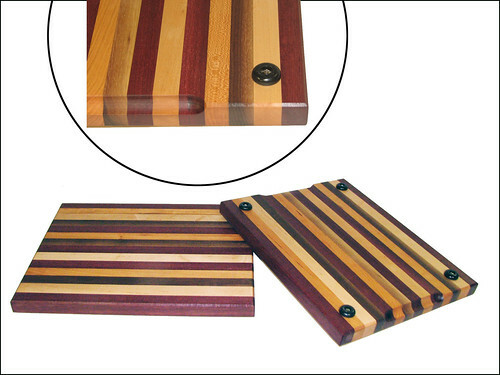 From the outsides, the wood species are purpleheart, cherry, maple, walnut. 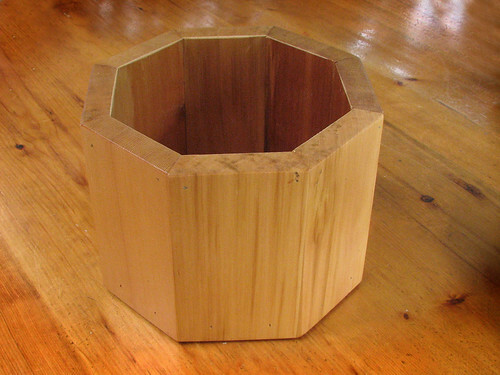 Octagonal Cheese Board, originally uploaded by rgdaniel. 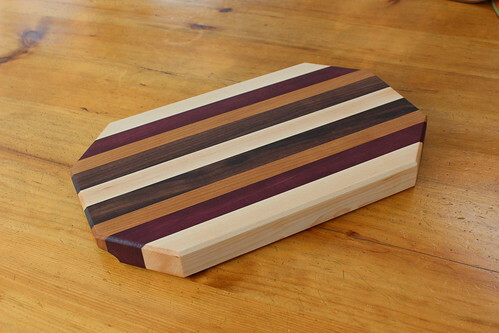 This cutting board is billed as a cheese board here, if only because that’s how it was requested, and because it’s a good compact size for that, about 8″x12″. It’s an inch-and-a-quarter thick, so the finger recesses leave ample room for even my giant fingers to slip underneath and lift it easily. 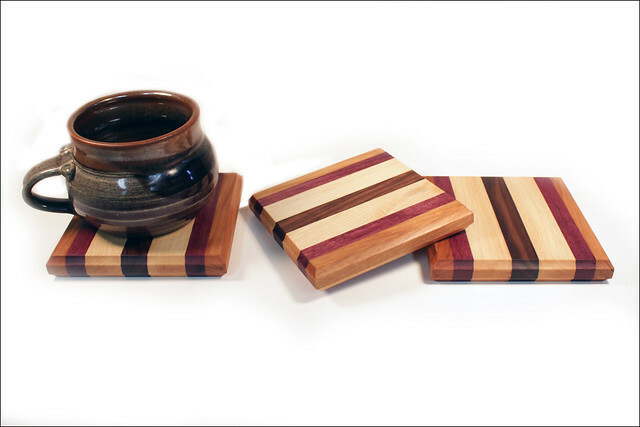 The wood species (from the outside edges) are maple, purpleheart, cherry, and walnut. For food-safe reasons, it’s finished with mineral oil, just the kind from the drugstore. This one is spoken for but there’s another exactly like it, except it’s 14″ long, that is available. As always, just holler. We have kind of an "Octo" theme going in our house. There is a small octagonal stained glass window above the front door, I built some large octagonal planters a while back, and one of our gardens is octagonally bordered, so here’s a couple more on that theme. Octo Cheese Board, originally uploaded by rgdaniel. The octo cheese board matches the larger laminated breadboard I did recently, and is actually left over from the laminated top for a matching bread box that is in progress. Octo Planter, originally uploaded by rgdaniel. Big Stripey Boards, originally uploaded by rgdaniel.